If you are the '16th Classic Cars in the Park' Vehicle Show organiser and you would like to update or amend the details shown, please contact us. Thank you. When is the next 16th Classic Cars in the Park? Sunday 26th May, 2019. 16th Classic Cars in the Park is listed under May 2019 Vehicle Shows. Although we try to keep the information for this event as up to date as possible, we cannot guarantee that things haven't changed at the last minute, and we haven't been informed. Therefore, please contact the '16th Classic Cars in the Park' event holder directly to confirm all details (especially event name, dates and location) before setting off to Penrith. The 16th Classic Cars in the Park is planned to take place at Hutton-in-the-Forest, Penrith, Cumbria, Sunday 26th May, 2019. You may reach the event organisers on 01697 451882. Classic Cars in the Park. 2.5 miles off M6, Jun 41. Home of Lord & Lady Inglewood & family, Glorious setting in the park. Historic house, gardens, parkland and tea room. 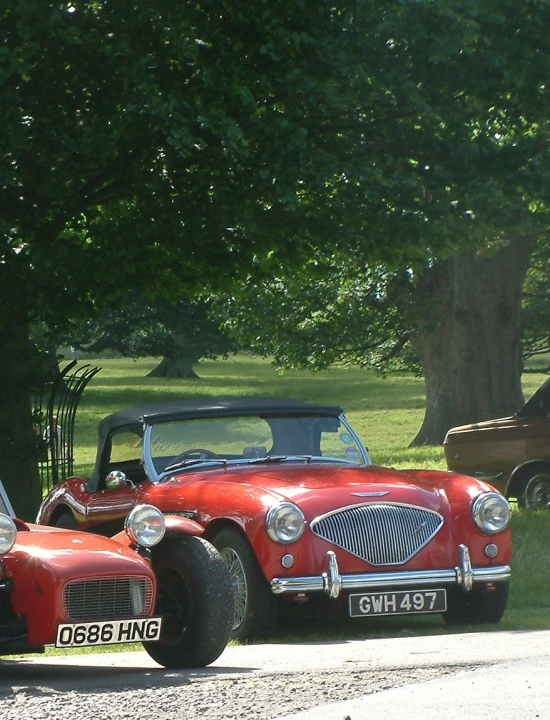 Classic cars, Bikes, Light commercials set in the park in front of the main house plus tea room and topiary garden. House tours from 1pm ( separate small admission) Well behaved dogs welcome in the park. Autojumble/trade plots £25 each, please call for further information. Adm adult £7, child £2.50, 10am - 4pm. Show Admission includes park, gardens and tea room.